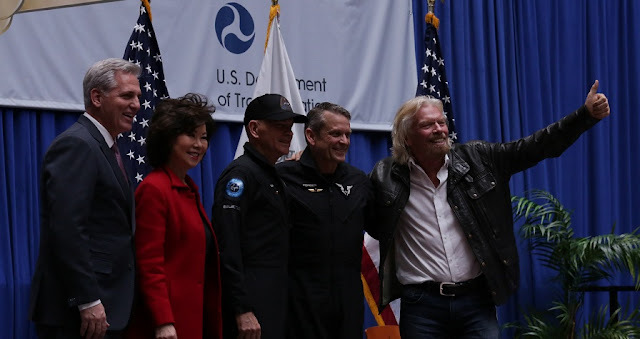 U.S. Transportation Secretary Elaine L. Chao on Thursday pinned FAA Astronaut Wings on Virgin Galactic’s SpaceShipTwo crewmembers, Test Pilots Mark “Forger” Stucky and Fredrick “CJ” Sturckow. Last year’s historic spaceflight marked the nation’s return to space on an American-made rocket, and paves the way for future travel to space with commercial spaceflight participants. On December 13, 2018, Virgin Galactic’s SpaceShipTwo, named the “VSS Unity” was carried aloft by the WhiteNight Two carrier aircraft from the Mojave, California Air and Space Port. With Stucky and Sturckow onboard the VSS Unity, the WhiteNight Two gradually climbed to an altitude of almost 40,000 feet where it released the spacecraft. Stucky and Sturckow lit the engine and guided the VSS Unity 51.39 miles (271,340 feet) above the Earth and into space. The vehicle returned from space and safely glided back to the spaceport, guided by its pilots. The VSS Unity was manufactured in America by The Spaceship Company, a California-based company owned by Virginia Galactic and headquartered in the Mojave dessert. Stucky and Sturckow now become two of only four Americans to receive FAA Astronaut Wings. In 2004, Scaled Composites was awarded the $10 million Ansari XPrize when it sent the reusable SpaceShipOne on two successful FAA-licensed commercial spaceflights. The test pilots of those flights, Mike Melvill and Brian Binnie, received their FAA Astronaut Wings directly after the last flight of the vehicle on Oct. 4, 2004. The FAA is responsible for licensing, overseeing, and regulating all U.S. commercial space transportation activities. Among the many FAA requirements for Astronaut Wings is the requirement that the wings are only to be awarded to crewmembers who fly beyond 50 statute miles above the surface of the Earth on a launch vehicle licensed (or permitted) by FAA’s Office of Commercial Space Transportation. A statute mile is one land-measured mile.